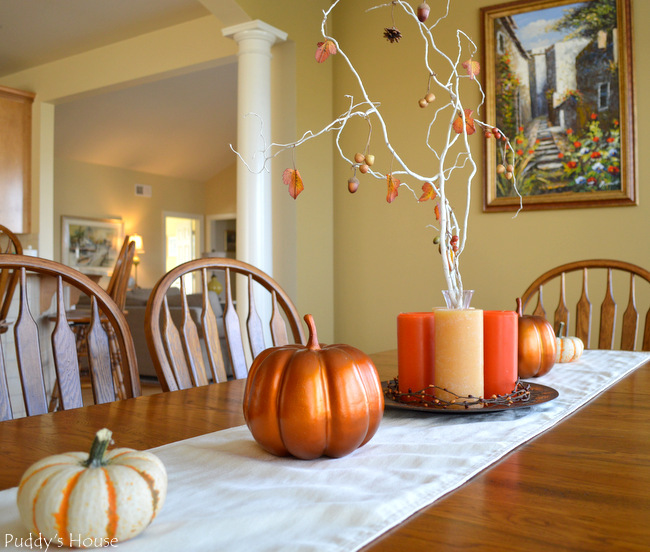 Surprisingly, I managed to decorate our house for Fall the day before it is actually Fall! 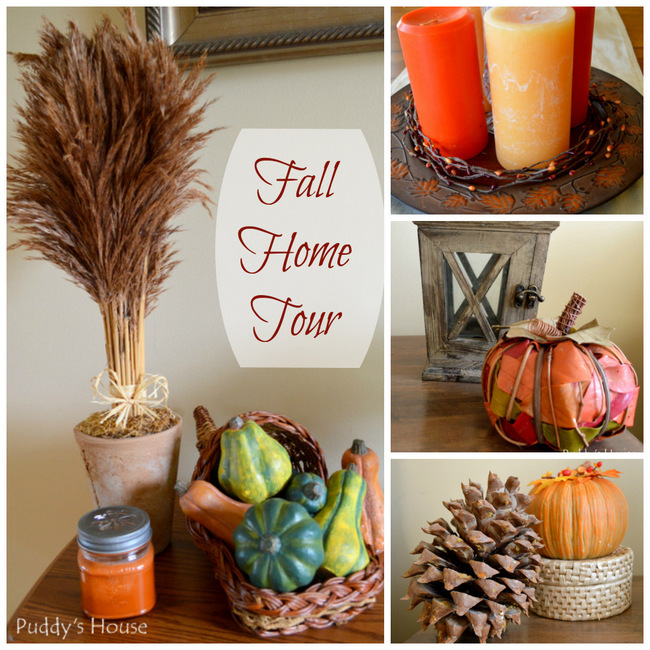 For your everyday person, the day before Fall is early to have your decorating done, but for a blogger it is late. I was fortunate to have some time at home today to pull out all my fall decorations and get busy. I tried to change up my décor so that it looks different from last year and the year before. I started with the dining room table. I found this pretty charger at the grocery store today; I think it was $2. Right away I knew I wanted to put candles on it, so I pulled out 4 candles and put on the charger. I’ve had these 4 in my supplies for a while and have yet to burn them…maybe this year. Once I put the candles on the charger, it still needed something more. I had a bunch of these stems with berries in my wreath making supplies. I just pulled them all apart and wrapped them around the candles and I thought that was it for the centerpiece. But, I realized once it was on the table that it needed more height. I pulled out my trusty spray painted branches and put them in a little bud vase. Some of the branches still had the leaves and acorns hanging on them from last fall. I just rearranged based on the branches that I used. The faux pumpkins were in my supplies too. I added 2 little real pumpkins to finish it off. 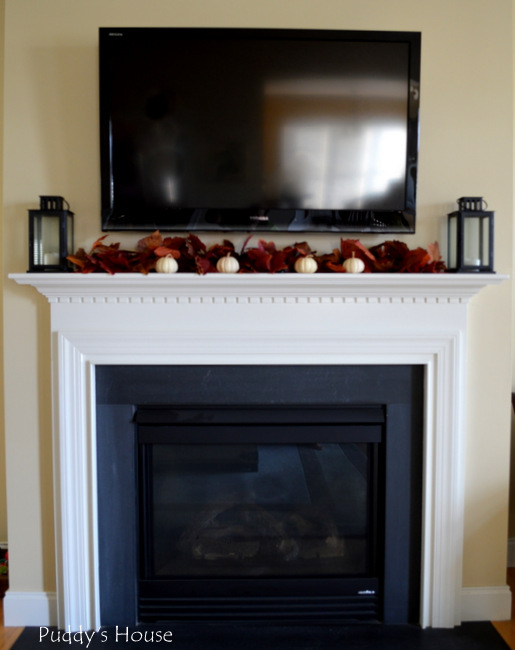 Next up was the mantle. I knew how I wanted the mantle for a while now. 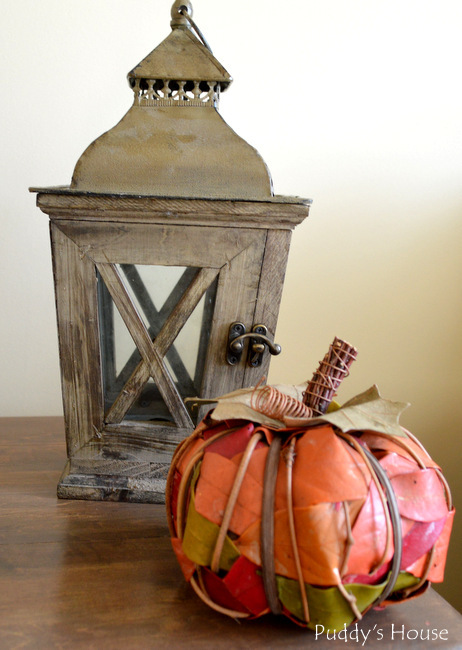 I always forget about my lanterns, so this year I was determined to use them in my fall décor. Normally, they only get used for summer nights on the patio. I had planned to pull out the candles and fill the lanterns with gourds or little pumpkins, but when I put them on the mantle with the garland and the baby boo pumpkins, I thought the white candles helped balance out the look. 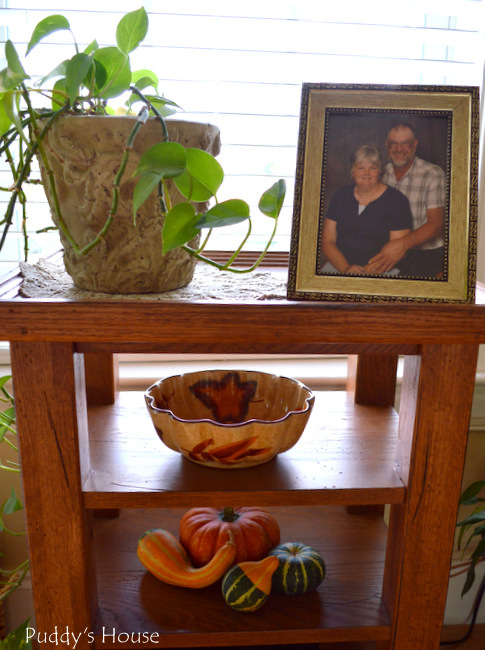 I added touches of Fall to a few of the tables in the living room. I had the pumpkin in my supplies, it is either from a yard sale or thrift shop. The pine cone is from my Grandmother. She got it in the Redwood forest. It makes a good fall decoration. 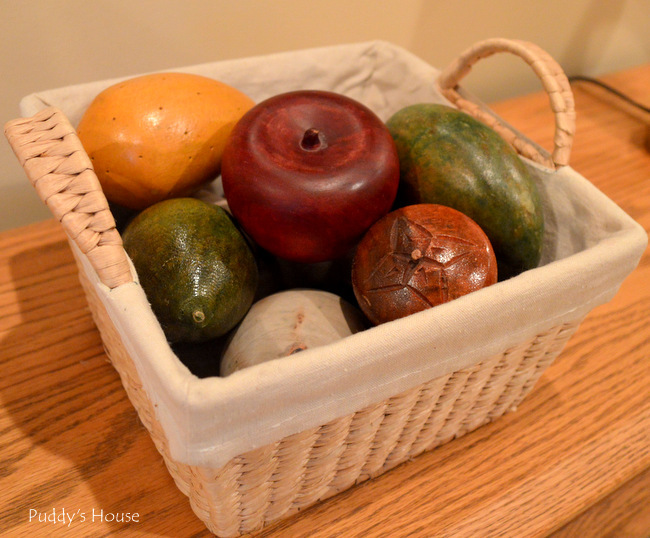 The little basket actually holds woven coasters and is out year-round. The only new item for this side table is the lantern, and it’s not brand new, I picked it up for $4 at a yard sale this summer. $4 is a lot for me to spend at a yard sale, but I really liked this one. I’ve had the leaf pumpkin for years. 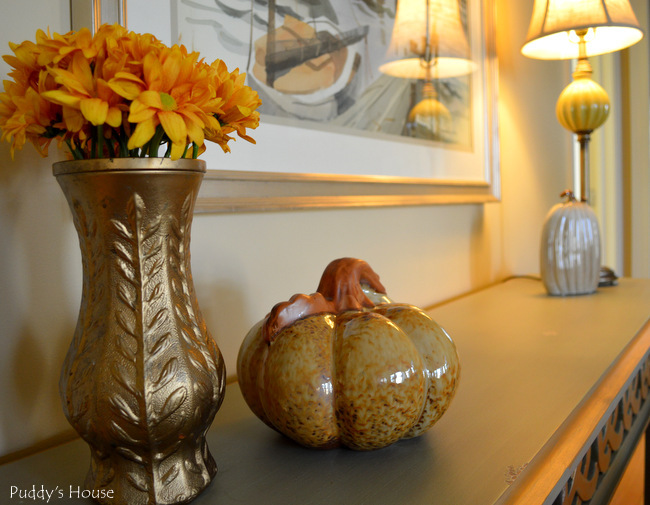 I put two of my favorite ceramic pumpkins on the console table in the living room. Fresh flowers always brighten up the room too. 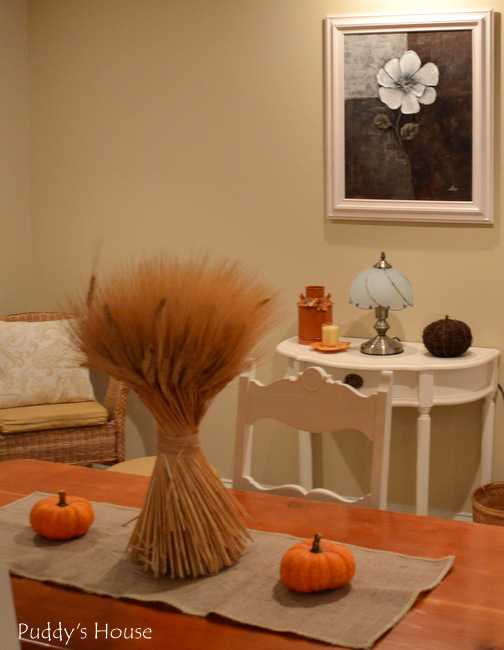 The foyer is dressed up for Fall too. Of course, you are greeted by the porch décor, but once you open the door, you are officially welcomed. 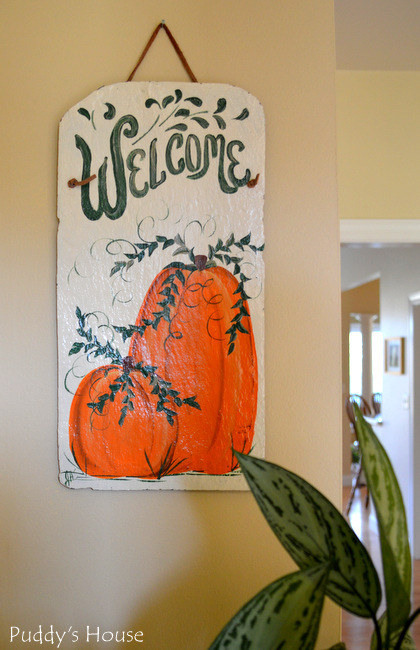 I got the welcome sign at the thrift shop at the end of Fall last year. The foyer table got a mixture of new and old decorations. 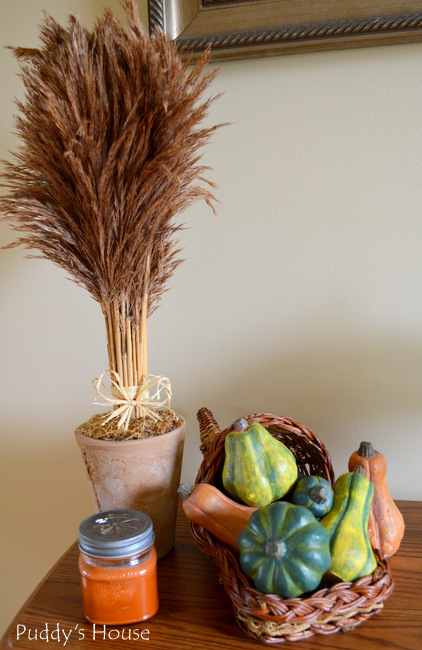 The potted wheat was used last year in the foyer. I had the cornucopia last year, but added the ceramic gourds this year. 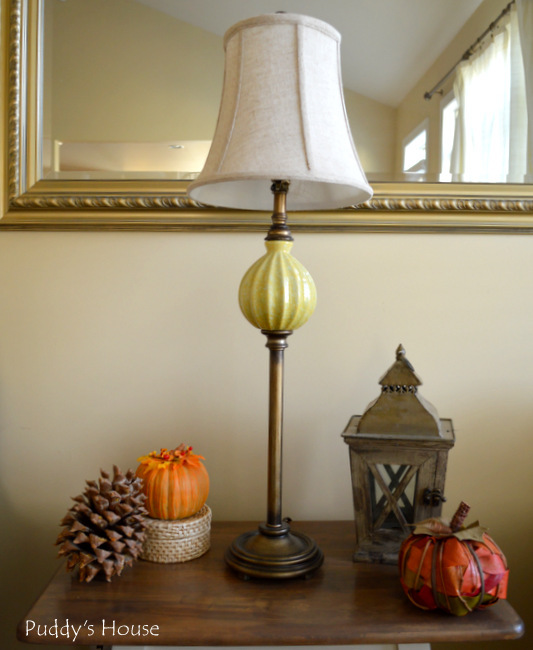 I picked them up at the thrift shop, and the fall candle completes this side of the vignette. 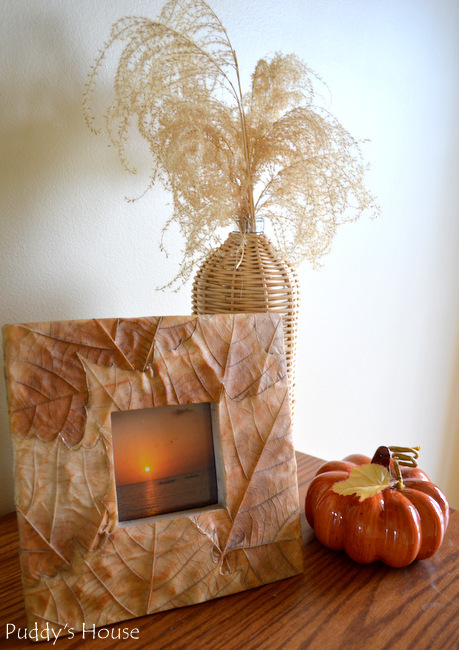 On the other side, I added a fall leaf frame with a ceramic pumpkin and then dried grass in the woven bottle. This year, I added some fall decorations to the basement. I skipped it last year, because honestly at this time of year we don’t spend too much time down there, but as soon as the early evening darkness sets in we start spending more time in the basement. 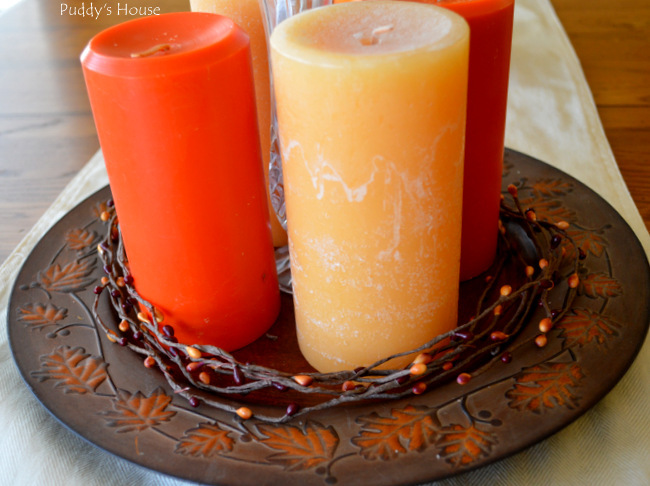 So this way, I have it warmed up a bit with the fall décor and ready for us to enjoy it. The dining table in the basement got the centerpiece that I used last year upstairs. 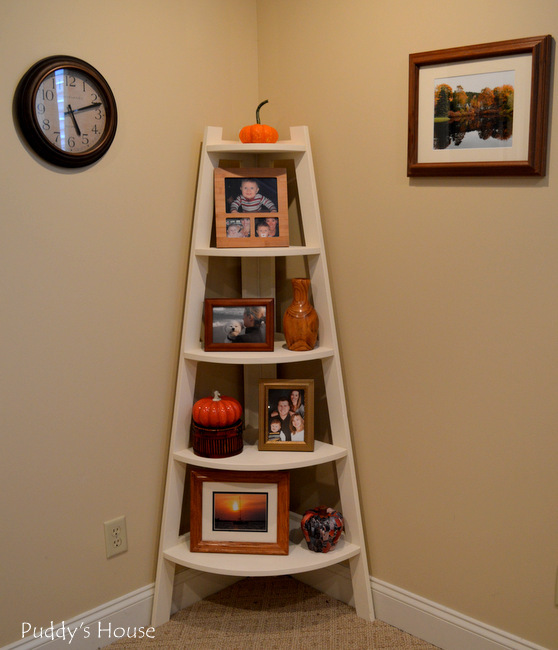 I added a few other fall items to the side table to complete this corner of the basement. 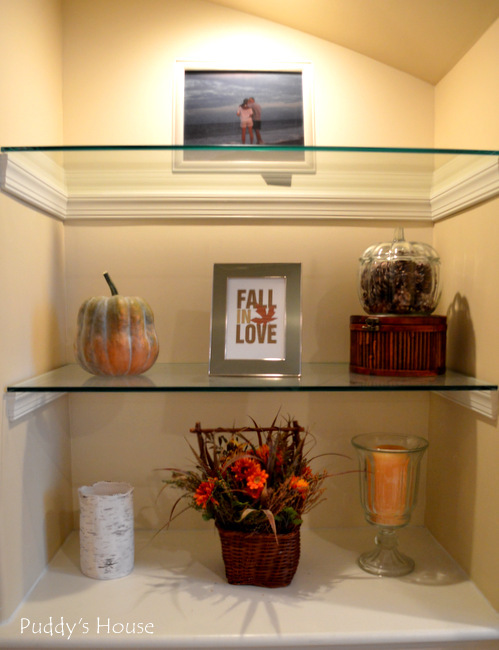 Decorating the built in shelves is always fun, but challenging. I’m finding it gets easier each time I change them out. I stick to a basic layout of items and just replace one at a time. On this side, most of the items are normally there, but I made a few swaps. I put leaves in the glass vase instead of the balls that are normally in it. I swapped out a glass piece for the basket wrapped candleholder. 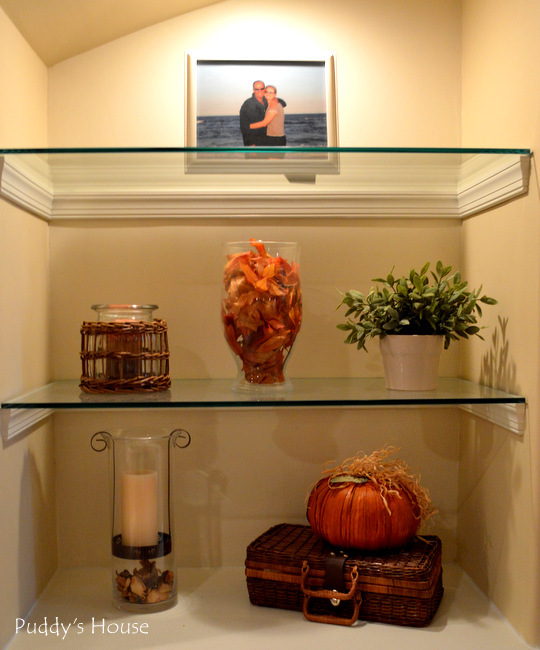 And, on the bottom shelf, I just removed the seashell and put a pumpkin in its place. On the other side, it was the same process. The only 3 items that are the same year round are the green frame and the large glass candleholder, and the picture up top of Bob and I. I found a free printable on Pinterest and put it in the green frame. The pumpkin is real. 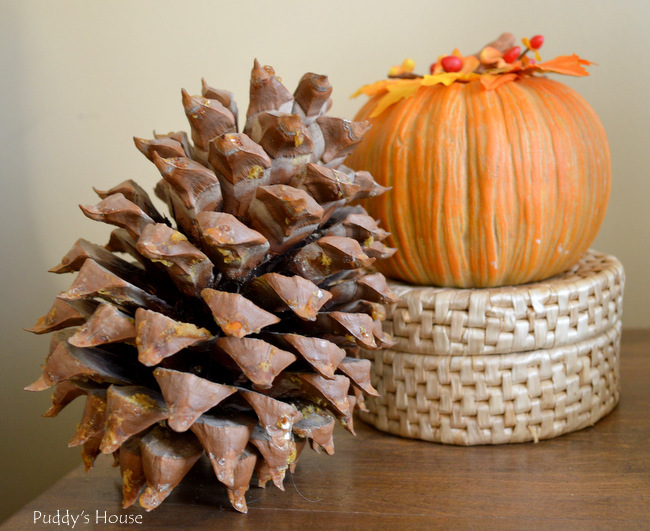 The glass pumpkin and pinecones are from last year, and I just set them on top of the round container that I found at a yard sale last weekend. I got the birch candleholder last year, but don’t think I had used it before. And the basket with flowers is either a thrift shop or yard sale find from last year too. 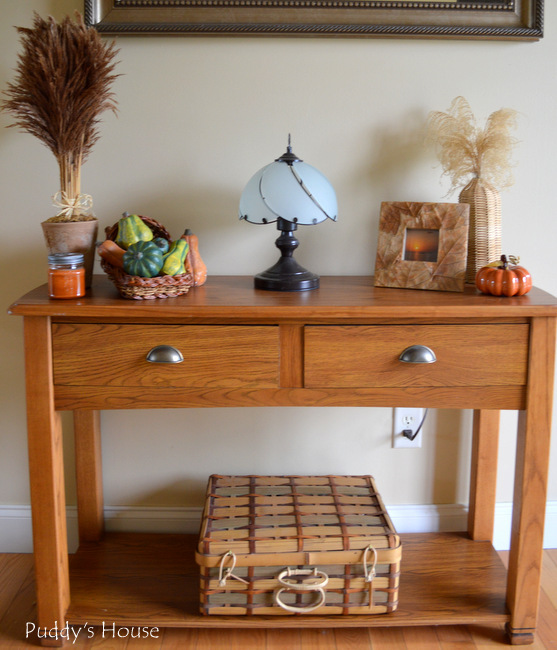 I added a small touch to the console table, just by popping some wooden balls and wooden fruit into a basket. 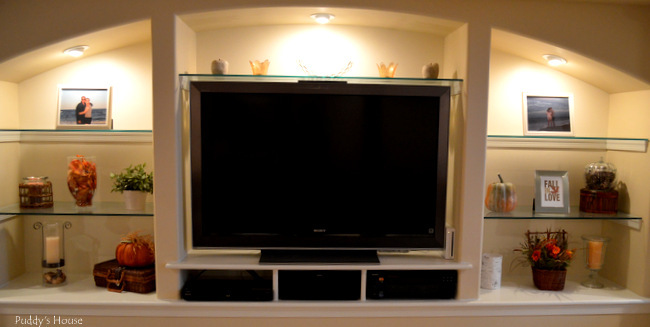 And, the last portion is the corner shelf. It always has all the pictures, I just changed the accent pieces on the shelves. The wooden vase is normally on the built-in shelves and I just moved it here. The ceramic pumpkin from previous years got perched on the smaller round container from last week’s yard sale finds. 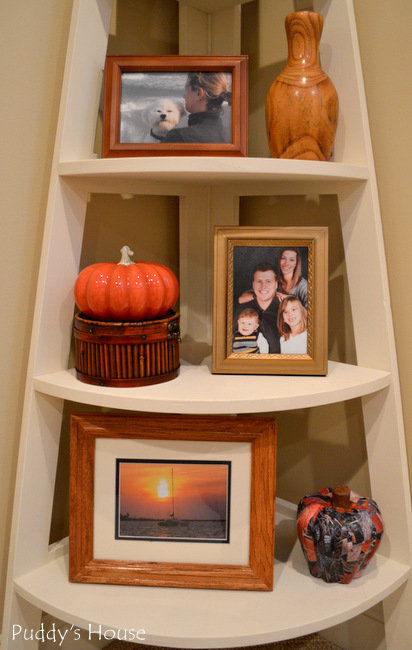 And, the pumpkin on the bottom shelf was modified by me, I just took a craft pumpkin and mod podged some scrapbook paper onto it. I’m sure I will keep tweaking my fall decorations, but most of it will remain the same. I had some fall crafts I wanted to try, but my one attempt today did not go so well. 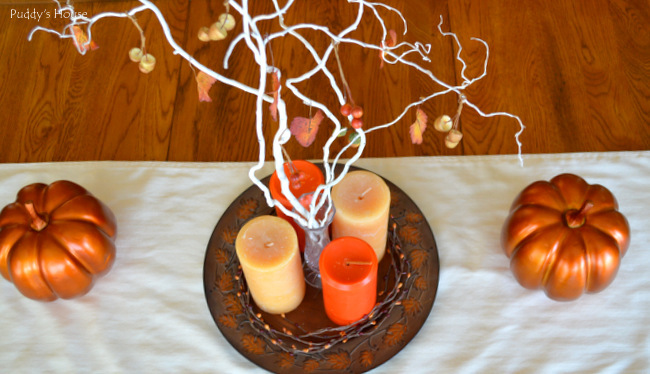 Have you decorated for Fall yet? Do you change up your decorations each year?